The fish most people encounter today are deep-fried, square-shaped and surrounded by a bun. It is almost possible to forget that fish begin their lives covered in scales, rather than a crispy batter shell. Yet, scales are an essential part of fish anatomy, providing these aquatic creatures with external protection from many predators and dangers, if not from man. 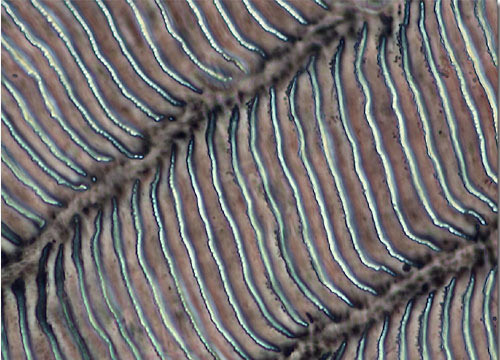 All fish scales, however, are not alike. There are four major groups, one of which is comprised of cycloid and ctenoid scales. The ctenoid variety have a comb-like, spiny posterior edge, their name developing from the Greek word cteno, meaning comb. Conversely, cycloid scales have a smooth posterior edge as their name from the Greekcyclo, meaning circle, implies. Both types of scales, however, consist of two main regions; a rigid surface layer chiefly composed of calcium-based salts, and a deeper fibrous layer consisting mainly of collagen. 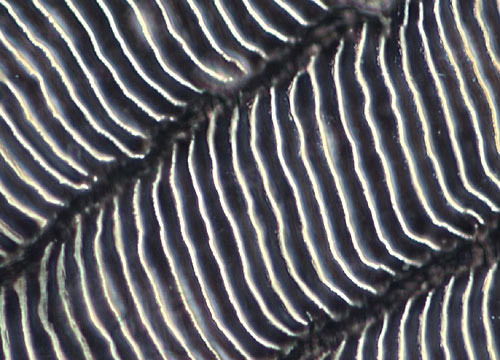 Interestingly, fish scales can be used to estimate the age of a fish. As a fish with cycloid or ctenoid scales grows, its scales also grow. The increase in size of the scales causes the development of growth rings known as circuli. Theses rings are similar to the growth rings in tree trunks. When the weather becomes cool, scale growth slows down and the circuli appear more closely together, leaving a dark band. It is possible to estimate how old a fish is by counting the bands, known as annuli.